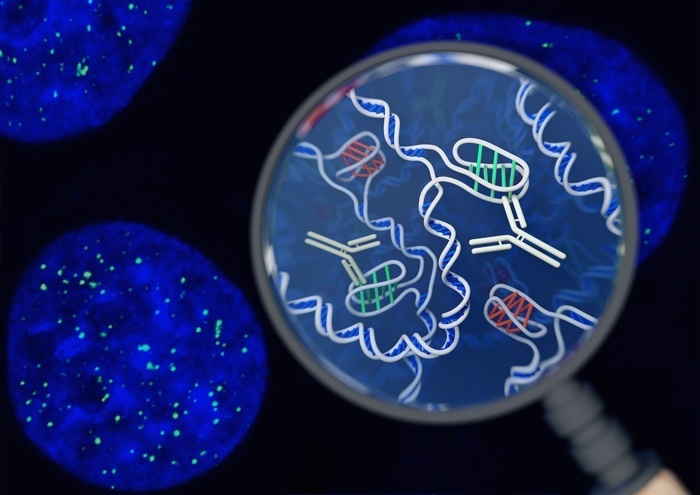 Earlier this year, scientists identified the existence of a brand new DNA structure never before seen in living cells. That's right, it's not just the double helix. The discovery of what's described as a 'twisted knot' of DNA in living cells confirms our complex genetic code is crafted with more intricate symmetry than just the double helix structure everybody associates with DNA. Importantly, the forms these molecular variants take affect how our biology functions. "When most of us think of DNA, we think of the double helix," said antibody therapeutics researcher Daniel Christ from the Garvan Institute of Medical Research in Australia back in April when the discovery was made. "This new research reminds us that totally different DNA structures exist – and could well be important for our cells." The DNA component the team identified is called the intercalated motif (i-motif) structure, which was first discovered by researchers in the 1990s, but up until now had only ever been witnessed in vitro, not in living cells. Thanks to Christ's team, we now know the i-motif occurs naturally in human cells, meaning the structure's significance to cell biology – which has previously been called into question, given it had only been demonstrated in the lab – demands new attention from researchers. "The i-motif is a four-stranded 'knot' of DNA," explained genomicist Marcel Dinger, who co-led the research. "In the knot structure, C [cytosine] letters on the same strand of DNA bind to each other – so this is very different from a double helix, where 'letters' on opposite strands recognise each other, and where Cs bind to Gs [guanines]." According to Garvan's Mahdi Zeraati, the first author of the new study, the i-motif is only one of a number of DNA structures that don't take the double helix form – including A-DNA, Z-DNA, triplex DNA and Cruciform DNA – and which could also exist in our cells. Another kind of DNA structure, called G-quadruplex (G4) DNA, was first visualised by researchers in human cells in 2013, who made use of an engineered antibody to reveal the G4 within cells. In the April study, Zeraati and fellow researchers employed the same kind of technique, developing an antibody fragment (called iMab) that could specifically recognise and bind to i-motifs. In doing so, it highlighted their location in the cell with an immunofluorescent glow. "What excited us most is that we could see the green spots – the i-motifs – appearing and disappearing over time, so we know that they are forming, dissolving and forming again," said Zeraati. While there's still a lot to learn about how the i-motif structure functions, the findings indicate that transient i-motifs generally form late in a cell's 'life cycle' – specifically called the late G1 phase, when DNA is being actively 'read'. The i-motifs also tend to appear in what are known as 'promoter' regions – areas of DNA that control whether genes are switched on or off – and in telomeres, genetic markers associated with ageing. "We think the coming and going of the i-motifs is a clue to what they do," said Zeraati. "It seems likely that they are there to help switch genes on or off, and to affect whether a gene is actively read or not." Now that we definitively know this new form of DNA exists in cells, it'll give researchers a mandate to figure out just what these structures are doing inside our bodies. As Zeraati explains, the answers could be really important – not just for the i-motif, but for A-DNA, Z-DNA, triplex DNA, and cruciform DNA too. "These alternative DNA conformations might be important for proteins in the cell to recognise their cognate DNA sequence and exert their regulatory functions," Zeraati explained to ScienceAlert. "Therefore, the formation of these structures might be of utmost importance for the cell to function normally. And, any aberration in these structures might have pathological consequences." The findings have been reported in Nature Chemistry.